This is our little Mr.Prog that's managing the HP. Click on him and see what he has to say! 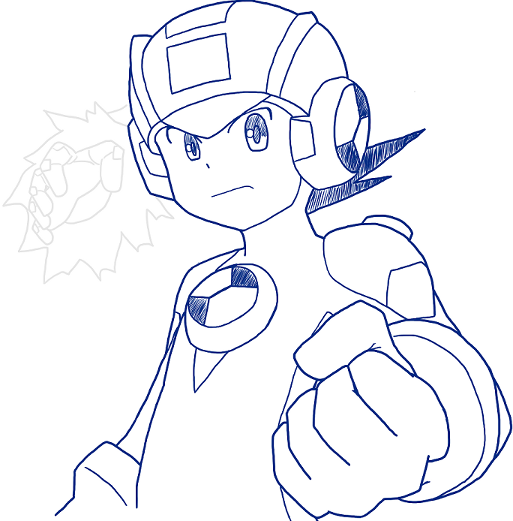 Chrono X is the WIP fully fan-made 7th entry in the Mega Man Battle Network series. Try out the demo via the button below, and be sure to involve yourself in the project! Hey guys, your friendly fangamer art director here with his first update on the main site! I was bored one day and I just decided to make this little sketch for you. I don't think today is a special day... For some reason, I feel like it is. Oh, well. I'm sure it's nothing. Going to get back to helping with Operation: Birthday Cake. Oh, I can't wait to show you guys the content we've been hiding! Be A Part Of Our Birthday! So, a while back I updated about our Operation: Birthday Cake event. You know, the stream we're planning to reveal major content on? Well, we decided to allow you guys the opportunity to participate as well. After the reveals, there will be a Question and Answer section. While we answer questions, we want to reveal your fan art submissions! There's no need to get competitive as anyone who follows the guidelines below will have their art shown on the birthday stream! Now's the chance to show some Chrono X love! Why re-design Raven? Well, we simply felt that compared to RiffMan.exe and future bosses (which we'll hold off until another update ), Raven's original design and animations were underwhelming, but we think the new design makes Raven seem more original and fit better into the world of EXE. You'll be able to play against this new Raven for yourself in Demo 4.1! What do you think? Copyright © 2013 | MD Productions. Website design created by MaxRock and edited by SoulRed12.